CKO Kickboxing franchises are built on the idea that everyone should love going to work in the morning. 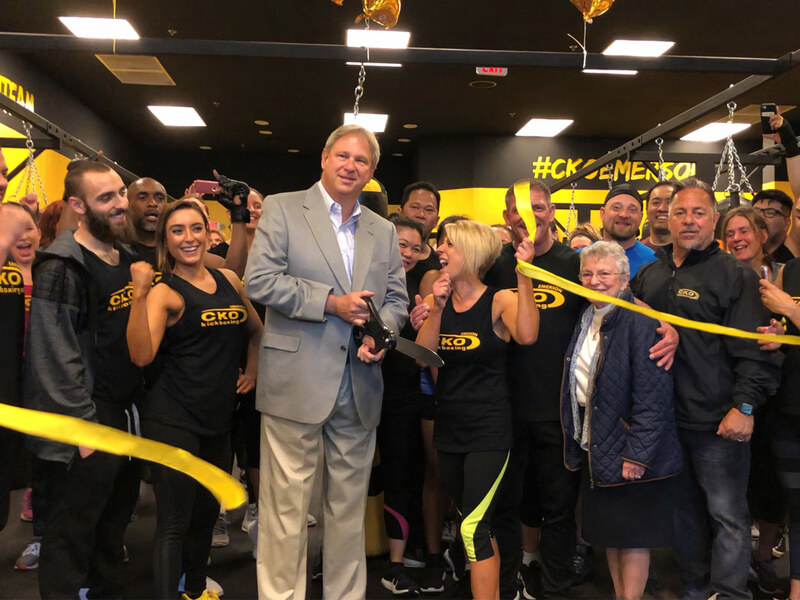 Our franchisees are engaged and motivated from the second they step foot in the gym. This is the ideal attitude for other individuals that are ready to change their lives and positively affect those around them. CKO Kickboxing uses the training elements from boxing to develop a total body workout that produces real results. All our classes are centered around group fitness to help members stay engaged so they are excited to come back. All workouts are completely customizable, which allows everyone to work at their own pace, no matter their age, gender or fitness level. During the kickboxing classes, trainers never focus on the fighting aspect of the sport or use advanced techniques, so all members always feel comfortable participating. This concept creates a welcoming environment that motivates people to come back every day for a fun, high-impact workout. The decision to become CKO franchisees has changed the lives of both myself and my husband, Danny, in every way possible. We have relocated to a new state and city where CKO did not yet have a presence, and we left our careers in television behind us. That said, it’s been the best decision we’ve ever made. We initially worried a little because we were so far from headquarters (our location is in Charlotte, NC) and thought we’d feel “alone” in the process. That couldn’t be further from the truth. The support we have gotten from day one, and continue to get as we run the gym has been so incredible, especially for two people with no previous business experience. The CKO Kickboxing team does everything in their power to ensure the success of each gym. There are over 60 CKO locations throughout the country and growing. But as new franchisees, my husband and I felt as if we were the first; that’s to the credit of the entire CKO team. We’re in constant contact with Rich Rosso, Director of Business Development and seek his guidance — and he’s always there for us offering his intrepid advice and vast experience. Plus, lest I not mention the kind of support we have received and continue to receive from CKO owner, Joe Andreula. As an example, my husband sent him an email because some of our instructors were experiencing some knuckle soreness from punching — not only did Joe get back to him, but he called him directly on a Saturday afternoon to offer some solutions. CKO Kickboxing is a growing company, and the concept continues to take cities by storm. We feel very lucky to be a part of it all. Nearly 80% of franchise owners were members before joining the team, which speaks to the passion that the community has. There is a natural progression for this to occur because CKO members are dedicated to their own success. Franchise owners understand that it’s not only their own lives that are changing, but the lives of each member as well. This unique position is inspiring, but also requires someone who is highly motivated and driven. Protected Territory: Once your location is mutually agreed upon, your location shall be surrounded by protected territory. Comprehensive Franchise Training: You will receive training at our corporate location in Hoboken, NJ to help build on your existing abilities. We also assist in the development of quality fitness and business skills. Regional Trainer Visits: We will come to your location before opening to help train you in additional key elements so that you can have a hands-on approach in your soon to open location. Gym Opening: We will assist you with weekly calls prior to and after your grand opening. Vendor Relationships: You can take advantage of our pre-negotiated, company-wide, vendor-approved suppliers’ list that will help to lower costs. Ongoing Support: Continuing guidance shall be provided in the form of correspondence and periodic telephone and written communication. What are you waiting for? If you’re ready to get out from behind a desk, improve your physical fitness and change the lives of others, it’s time to join the CKO community. To learn more about our kickboxing franchise, contact us to set up your introductory call. You have the drive inside you, let us ignite it. b. This offering is not an offering of a franchise. In New York (USA), an offering of a franchise can only be made by a prospectus that has been previously filed and registered with the Department of Law of the State of New York. The application for registration of an offering prospectus or the acceptance and filing thereof by the Department of Law as required by the New York law does not constitute approval of the offering or the sale of such franchise by the Department of Law or the attorney general of New York. c. OUR WEBSITE HAS NOT BEEN REVIEWED OR APPROVED BY THE CALIFORNIA DEPARTMENT OF CORPORATIONS. ANY COMPLAINTS CONCERNING THE CONTENT OF THIS WEBSITE MAY BE DIRECTED TO THE CALIFORNIA DEPARTMENT OF CORPORATIONS AT www.corp.ca.gov. A SPECIAL FORM HAS TO BE FILED IN CALIFORNIA IN ORDER TO MAINTAIN THIS EXEMPTION.